Are tattered, old and worn. Is what I wanted and believed. In the past week or so I have been thinking a lot. I’m told that my brain is fluffy since we arrived. I do feel a bit more fluffy since I have arrived, less stressed about most things and I have caught up on my sleep at last. It is good for the soul being here. I am probably letting things wash over me where previously I might have worried about them. I don’t know if it is a good or bad thing I have only been worried about him. Lately he has been doing the worrying about everything else which is really bad for him. He is getting about 4 hours sleep a night and his health and brain is suffering doing himself physical damage because he is run down. But he is like a man possessed trying to get things done, as though his time is running out. I hope it is not. We do not have an endless time here and will have to go back South for many reasons but he does not have to do it all now. There is time and there is no schedule up here. The summer is coming, we will make preparations for our next visit before we leave. I have been in a fuzz on the full blood pressure tablets lately but really struggled with breathlessness when I have cut back to half, despite becoming fitter due to the hill walking. So although there has been less of the usual stress clearly my body is still letting me know it still needs that different pace and medication is slowing it for me. I am two cups of coffee into the day before I can function but am sleeping so much. Knowing that Endometriosis can wipe out your energy reserves at the drop of a hat. I am still in pain but trying to work through it on most days, not overdoing anything just trying to do something constructive each day. It doesn’t help that our time clocks are way out of sync. We are getting to bed as it gets light whilst he drops off to sleep on the chair after dinner. I have trouble waking him up to get him to bed and by the time we get there we are hearing the dawn chorus. So half the day is gone by the time I rise. He leaves me to sleep and then resents the time it takes for me to get off the ground. We are trying to raise funds here by selling off some of our excess items but there are not that many up here since the break in and the hardships that followed. We will do the best that we can in order to stay here as long as possible. We do not wish to return to our lives down South at the moment, they have caused so much misery and heartache in the past 12 months that I would rather have hunger and a very basic life here feeling safe and healthier than I have been in months. I was walking the dog at 3am this morning. It was a beautiful full moon last night and the Farm track was lit up, bathed in its light with twinkling lights along the coast. It was almost silent, but for the small animals in the hedgerows. During that short walk, everything seemed totally right with the world. I felt true happiness in an instant. I could have happily walked across the hills for miles. No one around, alone with the dog and my thoughts. Silent from argument and cross words caused by pain and stress, the worries washed away in the moonlight. I loved the outlines of the tress around in the woods that surround us here. The bull in the field that we visit every day, slightly surprised to see us and snoring gently by his barn. We were totally at peace there in the moment. Whilst I walked along hoping and praying for a small miracle to enable us to stay here and calm our souls some more. It struck me that here in the darkness, I felt totally safe as though it was the most normal thing in the world to wander the hills in the dark at that hour. It was truly invigorating. I noticed that for the first time in months, I do not feel depressed. For someone who has battled with this depression for a few years now, it seems as though being up here has lifted a huge weight from my mind for as long as I am here. It makes me wonder if a more permanent move would be better for us all instead of the back and forth. When the weather is warm and we have just enough to get by, then we are extremely happy up here. A little left over would be a godsend. I worry about lack of contingency funds. Since the truck has played both of us up in the past week and we are several miles from shops for supplies. As he heads off out today, the truck has struggled again to start. There is muck in the fuel lines we think from when it ran out of fuel and it is causing us real problems. The tank is full and there is fuel cleaner in there but it is still threatening to conk out at any moment which is an extra concern we really don’t need. A return from the mechanic and it seems that it might be something more an auto electrical problem, here’s hoping they can get it fixed. Last week and again today I am struck by the effects of other people’s rubbish and how years later it affects us. I read somewhere as a statistic that all the plastic that ever existed still remains in the world today. This news saddened me greatly. I wondered how we would ever get rid of it. Although it is only a tiny small step I do try to do whatever I can not to buy anything needlessly wrapped in plastic. Save on bags and reuse everything possible. I wish I could say that I’m doing my bit, but I feel as though it is a drop on the ocean and that we are all such a long way off. On both occasions I was picking up rubbish in the garden. I would love to turn this place into a healthy garden, but several previous owners and my current neighbour here have some awful habits when it comes to litter and seem to think it’s ok to bury it or just leave it floating around the countryside. Something that makes me really mad. We spend a lot of time picking up other people’s rubbish here. The house was derelict when we bought it. Those of you who have been reading for a while will know that it is still in a bad state now but we are only one couple on a non existent budget trying to make a difference whenever we can. Yes I have dreams of off grid eco living off the land. By during today’s clear up I thought I wonder if it will ever be the sort of land which will bear fruit. I was standing in what used to be an orchard and will be once again one day. I was clearing up the debris of a life which ended in 2001, some16 years ago I thought. For someone who lived off the land, he didn’t think about the effect of his waste upon future generations or inhabitants. I cannot hold this against him really. I did not know the man and I don’t think he really thought about it. It was pointed out to me that due to the remote location it is not easy to get a rubbish collection up here. But for goodness sake, there are recycling bins in the village and at the end of the track a small village where they would collect it from, so I’m not buying that. 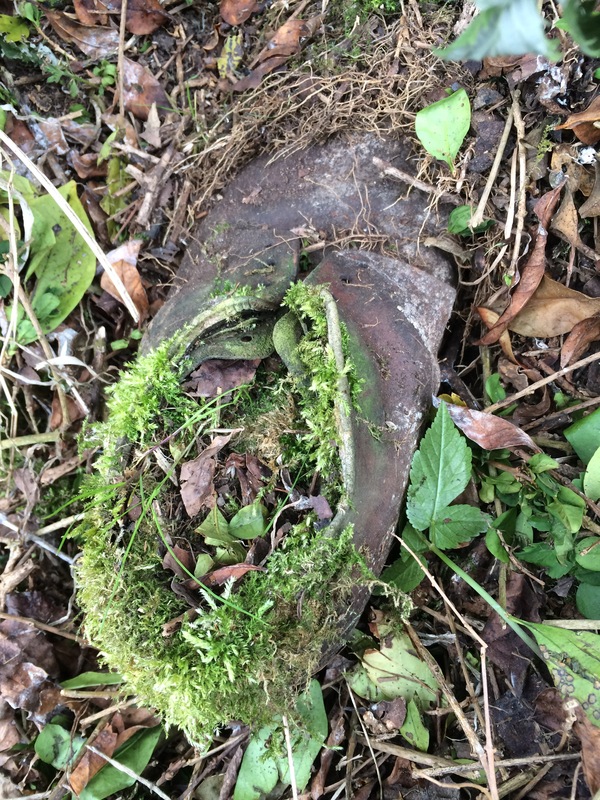 I picked up 6 pairs of leather shoes which were buried along the hedges. Toothpaste tubes, wine bottles and jam jars, cocoa jars and Fizzy pop. Plastic bread bags, probably of brands which no longer exist buried in the ground. But of course as the years go by, ground moves and things reappear. There was broken Crockery, plates, dishes. Glasses and wine and beer bottles. Plastic containers and that was just from the old boy who lived here. The last owner used this place as a dump. He was a glazier and so the amount of glass that has been shifted from here over the years since we took it over is astronomical. I think we will be unearthing it until the end of time. Just when you think you have found it all, you turn around and find more. 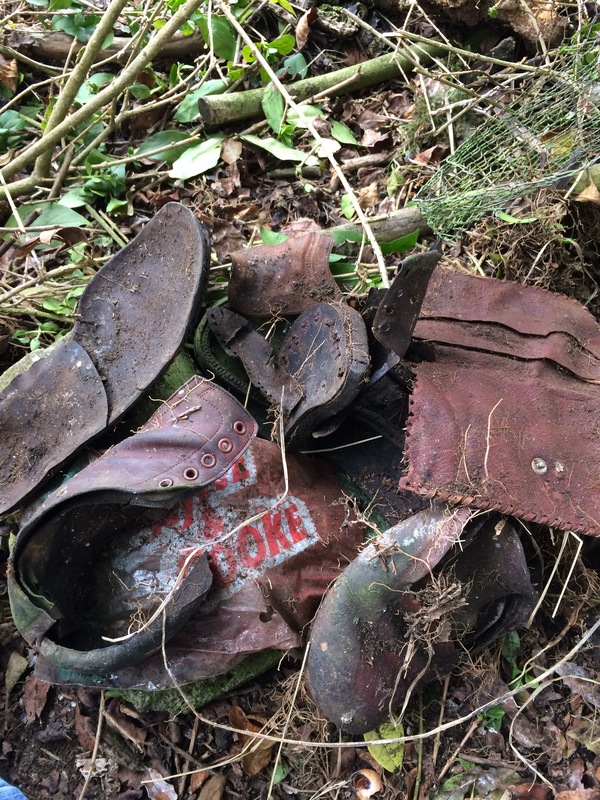 There are also rubber, window fittings, metal and plastic all over the place all surrounded by our woodland. What was once a lovely green space was tarnished by waste and is fighting to recover along with our help. It may sound crazy that I am worrying about the garden in a decidedly shabby house. But I hope that if I sort out the ground around it. It will be usable and things will thrive here again. It costs only the time that we put into it and a whole lot of effort but I hope that it will be worth it. So today we have recycled the glass jars and window glass we have found so far but we literally have not scratched the surface. Whenever you take or dig anything over, it is as though you haven’t done it all. The old toothpaste tubes and tin foil and cans have also gone to the recycling and rubbish dump along with a lot of rubber sections used by the glazier. I also found out something interesting. At least four pairs of leather shoes which have not broken down either and a tobacco pouch. The only thing that has rotted down has been the stitching. I wonder if he ever thought that part if his legacy would be found 16 years later after he died, buried in the garden. It probably wasn’t the type of legacy he had in mind at all as a writer and artist his legacy should have been far more artistic. You can find out a lot about a person from their rubbish, especially when they leave it laying around. We decided to make a track through the orchard to get to the back unearthing yet more of the same. There will still be trees, more will self seed no doubt and we will find some more to transplant later on. My partner talked about the possibility of a paddock one day. He has a yearning for me to have animals here. I voiced my concern today that we could be picking up glass there for years to come so I don’t even know if it is possible down the line. Maybe with a JCB to skim the top of it all it might, and we would probably lose the orchard in the process and it’s also such a lot of work and expense. It surprises me where we find it all. Around the edges, in the hedges and by the fences around the perimeter. We will have to build new ones later, a huge job (in my eyes) due to the area. But then I am used to a small plot when back South. To a farmer it’s nothing but to a townie, it’s something else entirely. My years of dreaming of eco living may not be possible on this plot due to it’s previous life. That saddens me more than I can say. I thought about my plans to litter pick on the beach when I go back back South but there is so much of that here I am starting on my home ground first. Tomorrow I will pick up the debris from the trees which were moved and felled and probably get the chain saw out. We need to restock the woodshed which has been seriously depleted on this trip due to the cold nights. Today it was warm and glorious followed by a windy evening and a beautiful red sky so I think we will be in luck for tomorrow.